Ben’s twin brother was the star kicker on the high school football team. His eldest brother was a star on the varsity soccer team and coaches already have an eye on his youngest brother. Ben never got that chance, despite the effort of coaches and helpers who carried him down the field in youth league practices. Ben’s parents first noticed something was not quite right when he didn’t start walking by the typical age, while his twin was in good health and developing normally. They were stunned by the diagnosis – cerebral palsy. He started using a walker followed by a cane and his mother got him on what would prove to be a life-changing waiting list. 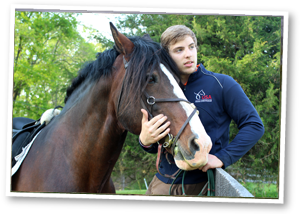 At age five, a spot finally opened up for classes at Loudoun Therapeutic Riding (LTR), the list his mother had fortuitously put Ben on when he was just a toddler. He was hooked. The young boy from an athletic family had found his sport. Just as a football player hits the weight room to condition, Ben hit the ring. He rode as much as he could, along the way improving his posture, balance, coordination and muscle tone. Now twenty, Ben can still be found giving back to the program that has done so much for him and is one of LTR’s best ambassadors. There are plans to build a permanent, expanded LTR facility including observation and therapy rooms, stabling for program horses and an indoor arena to meet growing demand. 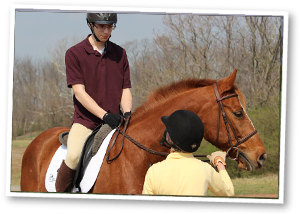 Not only does our son absolutely love the horses, but he has become calmer and more focused since beginning lessons with LTR. These benefits have generalized into other settings which has helped him to make great strides academically and behaviorally.